Scientists at Stanford University School of Medicine have just described in a new study how sequencing minute bits of DNA circulating in the blood of lymphoma patients can accurately identify the cancer subtype and pinpoint mutations that might cause drug resistance. The findings from this new study were published recently in Science Translational Medicine through an article entitled “Distinct biological subtypes and patterns of genome evolution in lymphoma revealed by circulating tumor DNA” and may help personalize cancer treatment by revealing which patients are likely to be treated successfully and those who may have a poorer prognosis. Using the sequencing data to track disease progression over time could also provide an early warning system that identifies the emergence of an aggressive form of cancer by providing a real-time window into tumor evolution. The results from this new study bolster the growing notion that noninvasive, blood-based biopsies of what's known as circulating tumor DNA are likely to transform cancer care. The Stanford team was able to collect samples from patients with diffuse large B-cell lymphoma (DLBCL) and 24 healthy subjects. 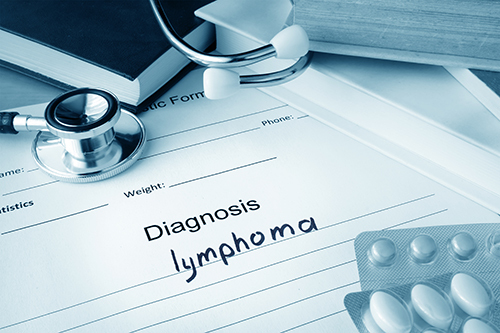 DLBCL is the most common type of non-Hodgkin lymphoma and is highly biologically variable. Thus, patients vary widely in their response to treatment. About one-third of seemingly successfully treated patients eventually relapse, or their tumors become resistant to treatment. Additionally, a form of indolent B-cell lymphoma, which progresses slowly with only mild symptoms, can transform without warning into an aggressive form of the disease. The researchers used an enhanced version of a next-gen sequencing technique they developed called CAPP-Seq (cancer personalized profiling by deep sequencing) to isolate and sequence circulating tumor DNA, or ctDNA, from blood samples from the patients. Unlike previous studies, which tracked lymphoma progression by monitoring the sequence of just one cancer-associated protein, CAPP-Seq can identify a much larger range of mutations in the tumor genome. By comparing the ctDNA sequences obtained from the patients' stored blood samples with those of the tumor cells from invasive biopsies with information that was known about the course of the patient's disease and eventual outcome, the researchers found that low levels of ctDNA after diagnosis but before treatment correlated strongly with progression-free survival in the patients. Conversely, those with higher levels of ctDNA faired more poorly overall. Furthermore, the research team could detect the presence of ctDNA in the blood of relapsing patients on average six months before any clinical symptoms appeared and 2.5 years before clinical signs of relapse. Importantly, the researchers found they could use CAPP-Seq to determine the type of B cell from which the cancer originated and predict prognosis. About two-thirds of people with the germinal center subtype live for five years or more after diagnosis, while those with activated B-cell-like tumors have a poorer prognosis with current treatment regimes. These subtypes are known to predict differential responses to emerging targeted therapies, but they are cumbersome to measure accurately and require biopsies. Additionally, the Stanford researchers were able to predict from the ctDNA sequences those patients whose disease was transforming into a much more aggressive form prior to the emergence of clinical symptoms and even to identify and track specific mutations known to inhibit the response to the targeted therapy with a drug known as ibrutinib.